Census counts of how many people in counties outside Manhattan commute to other counties outside Manhattan. Many workers in the region would be well-served by a through-running regional rail network. The Regional Plan Association’s recently released Fourth Regional Plan calls for massive investment in greater New York’s transit infrastructure, including multiple regional rail tunnels. Has RPA mapped out a vision for regional rail that should guide New York and New Jersey for the next few decades? Yes and no. The RPA’s core concept is to unify the region’s three commuter rail systems — the LIRR, Metro-North, and New Jersey Transit — with through-running service making new transit trips possible. Northern New Jersey residents, for instance, would have seamless service through Manhattan to Long Island or Connecticut, rather than terminating at Penn Station. Broadly speaking, this is exactly what long-term regional transit planning should aim for, but the Fourth Plan’s specifics are lacking. Looking at the market for regional rail and how new infrastructure can accommodate it, there’s a better way to deliver a useful through-running network — with better service at less cost. Here’s how. Subways and buses will always be the most important types of transit in the New York region, since most people either work in Manhattan or in their home county. But through-running regional rail could still serve a large number of people who don’t get much use out of existing commuter rail service. The Census Bureau has data on commuting between each pair of counties in the nation. 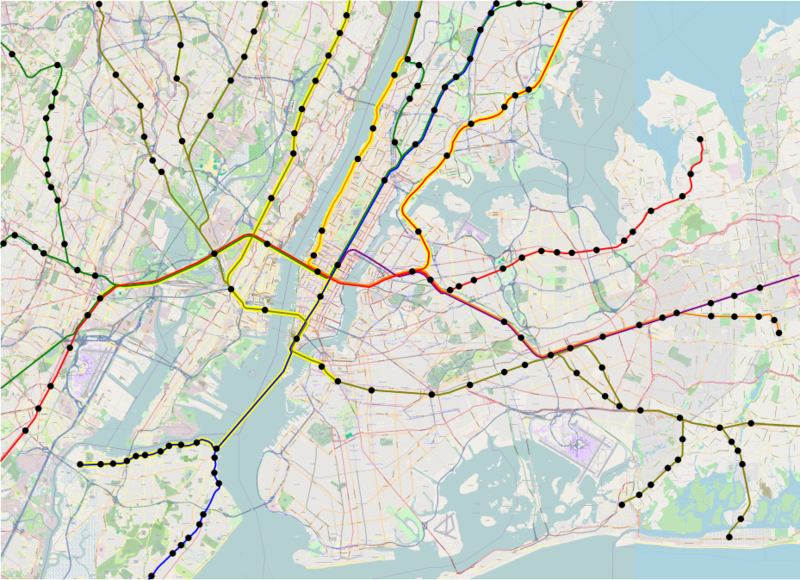 Many commuters in the New York region pass through Manhattan and would be well-served by a seamless regional rail network (shown at the top of this post). For example, 32,606 people live in New Jersey or Rockland County and work in Brooklyn. These travel markets combined have about 190,000 daily commuters who make 380,000 one-way trips each weekday. Currently, the total combined weekday ridership on the region’s three commuter rail systems is about 800,000, so this represents a potential 50 percent increase in ridership, before factoring in new development around stations. Not all of these travel markets are equally strong candidates for regional rail. Between New Jersey and the Bronx, the Cross-Bronx Expressway is faster than trains through Manhattan could be. But some are very strong: Regional rail connecting to the downtown Brooklyn business district is likely to capture close to 100 percent of the current travel volume, plus additional trips as areas around suburban stations are developed. Of the entire market for through-running regional rail, 43 percent of trips start or end in Brooklyn. This means that just running trains from New Jersey to Long Island and Metro-North territory is not enough. Today, the only commuter rail service to Brooklyn comes from the east on the LIRR. To realize the potential of regional rail, new tunnels are needed, in addition to Gateway, with special attention to Brooklyn. In this service map, there isn’t a one-seat ride between every pair of counties outside of Manhattan. That’s fine: There are still convenient connections from Long Island to Newark, or from Westchester to Brooklyn, which would involve cross-platform transfers at new stations in Sunnyside or Lower Manhattan. The single largest travel market benefiting from through-running, between Brooklyn and northern New Jersey, gets a one-seat ride, or a two-seat ride with a change at Secaucus. 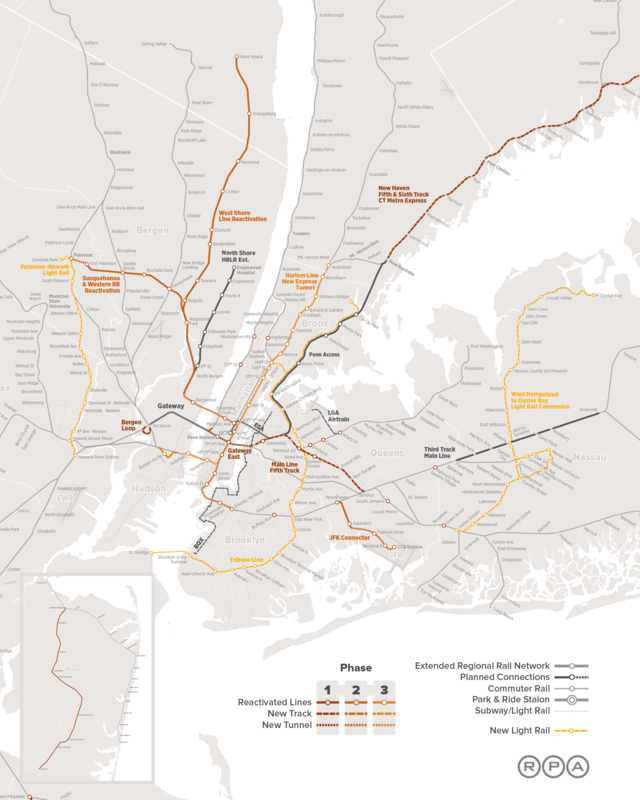 This plan depends on three new underwater tunnels: the Gateway tunnel with a connection to Grand Central, a tunnel under the Hudson connecting Lower Manhattan with Jersey City, and one under the East River connecting Lower Manhattan with Brooklyn. The RPA plan offers similar service quality, with one-seat rides to Brooklyn from Westchester, though not from New Jersey, whose commuters would need to make a cross-platform transfer in Manhattan. But it involves five new underwater tunnels — one more under the Hudson and one more under the East River than the map above. Missing from the Fourth Plan is a direct connection between Penn Station and Grand Central, which remains technically feasible and could enable through-running services without building as much tunnel mileage as RPA calls for. Tracks linking Penn Station and Grand Central would also put two centrally located stations on the same line. This adds significant value because it gives commuters a choice. Two projects already in the works are based on this value proposition: East Side Access is going to offer Long Islanders a choice between Penn Station and Grand Central, and Penn Station Access is going to do the same for Metro-North riders on the New Haven Line. A direct connection between the two major stations would also offer a choice to commuters in New Jersey and on the other Metro-North lines. The more suburban commuters heading to Midtown have this choice, the better service will function, because peak loads will be more evenly distributed, as Montreal-based transit advocate Anton Dubrau has pointed out. Right now, every full commuter train arriving at Penn Station or Grand Central has to completely empty, which crowds each station’s narrow platforms. With two stations, only half the passengers would get off at each, so trains would clear faster. This is only possible if the same train serves multiple city center stations. Most successful regional rail systems have multiple stations in the center of the city for these reasons. In Paris, which should be the model for New York and other large cities, there are several central stops on each regional rail line, serving legacy train stations and business centers within the city. The same is true in other big cities with through-running service, such as Tokyo and Berlin. In the United States, Philadelphia’s through-running regional rail system has three central stops. The Fourth Plan recognizes the need for multiple center city stations. However, RPA’s Midtown East station is at Third Avenue and 31st Street. Unlike Grand Central, this location is not within the peak employment area of Midtown and only connects to the 6 train (not the 4/5 express trains or the 7). As a result, most people would continue to disembark at Penn Station during rush hour, leading to the same platform crunches as today. There’s an extensive market within the New York region for through-running regional rail. The RPA’s Fourth Regional Plan recognizes this by calling for the integration of LIRR, Metro-North, and NJ Transit service. But the details of how to deliver that with new infrastructure need more work. At rush hour today, full trains empty at Penn Station, crowding the platforms and passageways. A connection to Grand Central presents an opportunity not just to offer through-service, but to give passengers more choice about their Manhattan destination, and decongest Penn Station’s platforms in the bargain. I tend to think the non-work trips dwarf those numbers. Either way, through-running is something which is strongly needed here. Just keep the ESA tunnels boring under Lex to Wall Street and then swing East to connect to LIRR Atlantic terminal in Brooklyn. By the time the tunneling is complete in a few years, the Pols will have figured out how to pay for the build out. Those county to county numbers include how many trips starting or ending in proximity to a rail station on either end? Until the NIMBYism goes away, why drain the city further to invest in the suburbs? Wait 20 years until Generation Greed has been forced to sell. And then another 50 to pay off the debts they will leave behind. 1. Much of this plan is about Brooklyn. 2. The part of Jersey I’m connecting Brooklyn to isn’t that NIMBY. Bergen County permits 4 annual housing units per 1,000 people, which is bad, but the city permits 2.5 and nobody is saying there shouldn’t be investment there until it upzones. And Hudson County permits ~7 housing units per 1,000 people. The closer to the city a trip starts from, the more benefit there can be had from through-running. That’s why it’s important to supplement any regional rail plan with infill stops. Maybe, but if you want to connect Hudson County to Brooklyn, at Brooklyn’s expense, that can happen much cheaper and faster by making subway to PATH a free transfer. Yes, there would be a transfer at WTC/Fulton Center, where a wide variety of subway lines are available. And yes, those on the Hudson/Bergen light rail would require two transfers. But how many subway riders get all the way from their origin to their destination without any transfers? If we citizens of Greater Gotham can make it easy for the future limited-mobility versions of ourselves to get between Downtown Brooklyn and Secaucus Junction, there’s no telling what we can accomplish. Great analysis, and very interesting. I often hear skepticism that there is a demand for regional rail, but this shows how much demand there is. How are these people getting around right now? There is demand for all kinds of mass transit now. But the reality is our future money has already been spent by the motoring generations in the past, and they are demanding more and more. Put a stop to that before anything else. A rehash of terrible ideas. Mr. Levy presented similar anecdotal evidence for a NIMBY rail effort in Westchester and Fairfield Counties. He was turned back in a matter of hours because his research quote: didn’t make any sense. The largest # in that commuter flows map is NJBrooklyn. So how about making that atlantic terminal stub useful and make it part of a PATH system that runs EWRJFK? Lol at “turned back.” I was told to make minor edits, I made them, and the piece appeared (it’s here and if you want to call a piece that mostly says “the noise impacts here are smaller than those of the freeway” NIMBY then be my guest). Moreover… I don’t recall a regular commenter here called Petra. Are you the same sockpuppet who keeps attacking me from time to time with innuendo? The sockpuppets who repeatedly said “no it isn’t” when I kept giving links to EMUs being cheaper than DMUs in Boston were charming; was that you, too? The PATH/subway transfer takes forever. Much worse than between Times Square and Port Authority, or 14th/6th and 14th/7th. Shouldn’t Amtrak be the #1 user of a Penn Station – Grand Central connection? For investments like Amazon HQ2 and similar in future that probably would be important and nothing to snark at. Out of curiosity, is this something that i actually discussed or even proposed? I keep going back and forth on this. I lean toward excluding Amtrak from the connection. The main reason is that then, north of Grand Central, the trains have to pass by 125th Street, a station with 4 approach tracks to the south and 4 platform tracks. The options for what to do then are all bad: have Amtrak stop at 125th (slowdown for intercity rail riders), have Amtrak skip 125th and other regional trains serve it (the mixture of faster and slower trains wrecks capacity), have everything on the two center tracks skip 125th (it underserves 125th, and the choice of which trains serve 125th and which skip it constrains scheduling among the three Metro-North lines). The main reason to let Amtrak use it isn’t because intercity rail riders need it, by the way. It’s that Amtrak really should be running 16-car trains, and then its trains would be bigger than the commuter trains, providing more capacity; this should be combined with letting anyone with a commuter rail ticket, or a MetroCard, ride between the two stations, provided they don’t take someone else’s seat. Thank you very much for putting these numbers together and putting them in map form for all of us to easily read! Do you have specifics though on if these inbounds from Jersey to Brooklyn are coming from a specific area (Newark, or Paterson, or West New York? etc), or is it all spread out? Are they primarily going to downtown Brooklyn, or other parts? Are Queens bound headed to Jamaica mostly, or the industrial areas around Maspeth? Or are the destinations also spread out? Depending where in the Bronx people are headed and where in NJ they’re coming from, a rail service running through Gateway/ESA and up over Hell Gate might actually be faster especially given the horror show the GWB/Cross Bronx are. On your map, are the highlighted yellow the services that would thru-run, or are you suggesting thru running the entire commuter rail network? I have been working on a very similar through running network idea. How would you solve extending the Atlantic Av line into lower Manhattan since the terminal is currently at IRT level? The only thing I can see is using the current easternmost portal into VD yard and hoping the tracks can dive down enough to pass under the B/Q tracks. I’m glad to see something more reasonable than the RPA plan and recognizes the flaws in their presentation of it (IE, lack of technical detail). I’m not entirely sold though on a north-south tunnel even with the movement between BK and BX. Is the old LIRR tunnel to the Brooklyn waterfront still usable, or did the subway cut it off? The WTC dinosaur was a huge missed opportunity to improve that connection. There’s a small group of rich NIMBY Connecticut residents who constantly try to push the NEC further inland and away from their stately mansions. Bob Yaro’s estate is along the NEC shoreline path. He comes up with a new Inland proposal every five years or so. There’s another NIMBY group, SECOAST, that is also trying to push the NEC inland. Alon Levy, either knowingly or unknowingly, jumped into the Connecticut NIMBYism fray. I don’t know what other people’s motivations are, but I do know that I’ve never once seen Alon say anything that he didn’t believe to make somebody happy. In fact, I’ve seen him torpedo his own chances at something lucrative because he wasn’t willing to go along to get along. I also know that he’s been proven right time after time. So if he agrees with a bunch of NIMBYs, then well, even a stopped clock is right twice a day. Just out of curiosity, since it’s the first time I ever hear about this dispute: what are the arguments against moving the NEC inland besides “some NIMBYS want it”? The proposed NEC Future high-speed rail alignment in contention follows I-95 east of New Haven (which isn’t what I wrote the article I linked to about). SE Coast is annoyed at a couple impact sites around Old Lyme and Old Saybrook. Most of their complaints can be addressed at either negative cost (the bridge over the river – the official plan has shallower grades than HSR can do, leading to longer approaches) or low cost (moving the transition curves to the west). A few can’t, but aren’t that impactful (an HSR viaduct next to a freeway is really not the end of the world). In Fairfield County, the official plan was vague on the alignment, so I looked more carefully. There’s impact, just not very much, and I say so in the article (which I’m about to take to my blog if you want to discuss it there). At a few places, it’s possible to reduce impact, by building on the less developed side of I-95. At a few, more impact is required to avoid wasting time (on slow curves) or money (on tunnels). Separately, there are some really expensive plans to go inland, via Hartford, which the most expensive variants of NEC Future look at. They will not be built because nobody will or should spend money on several tens of km of tunnel in Connecticut. …I confused you with some other commenters on another post. Sorry. At any rate, I wasn’t turned away within hours or anything like that. I sent a writeup, got some minor edits, and sent revisions. My understanding is that some parts of Fairfield County liked what I said and some flipped out. In case anyone wants to know what the piece in contention is, it’s on my blog now. Warning: it’s long even by my standards. The tl;dr note could be a short post by itself. Alon, are you familiar with the organizing principle of the Fugger-Express in Germany? No reason you should be, but I think it might help in combining trips through limited tunnel capacity. Trains could arrive at Jamaica Station from different branches of the LIRR, be joined there quickly, then move through East River Tunnels. Run through to Secaucus or Newark Penn, where they are disconnected again. In fact, our comments focus not on impacts, or “my back yard,” but on a deeply-flawed process, and on well-established regulatory law. To date, the FRA has refused to release documents requested two years ago through Freedom of Information requests (as required by both NEPA and the FOIA). FRA has garnered withering criticism from the press, the federal delegation, NCSHPO, and ACHP, for repeated and flagrant misstatements and for a faulty regarding Section 106 process. FRA failed to include a single transportation project in either CT or RI as part of their baseline comparisons for cumulative impact. It reached the point that FRA (somewhat comically) had to ask ACHP to hide publicly-posted maps — signed and circulated at the state and federal level for months — because they contradicted repeated statements by FRA leadership to the press, public, state and federal lawmakers. In the case of Alon Levy’s study, the FRA was refusing to publicly release detailed maps of NEC Future. This again falls afoul of NEPA. When we finally obtained a copy of the GIS data, we asked Levy to analyze them, and asserted no editorial control (aside from asking him in advance to neither support nor oppose the project in his conclusions). We have carefully read, and respected Alon’s work for years, and were happy to support his work, and to provide the public with a better understanding of what had been planned. I think the fact that we were willing to fund a pro-transit writer is a testament to our integrity, not the opposite (as you imply). In fact, SECoast has never opposed NEC Future in Fairfield County, our advice has been simply that the region needs transit solutions (judging in part by capacity projects in the 2010 Amtrak Masterplan), and that currently the New Rochelle to Greens Farms Bypass is the solution proposed. Repeatedly and clearly I have advised the public, that whether you are for or against these solutions, we encourage you to engage them, and to invited FRA for a public meeting. My advice to you, if you want to get these projects built, come and level with the public, give them a little patience and respect (even if they are often wildly misinformed), hold public meetings, tell the truth, and follow the law. We’re not all rich (frankly I share a 2008 Subaru with my wife). Nor are we all anti-transit (in fact I am strongly pro-transit and care deeply about its role in the economy of New England). Nor are we all NIMBY (which frankly, isn’t an argument, it’s an ad hominem). the funny thing is, Bob Yaro really didn’t have any significant role in opposing NEC Future despite the fact that a quadtracking proposal between Branford and Guilford would have modestly and indirectly impact his property. I’d be happy to take you to meet residents of New London and Charlestown, RI, who are anything, but wealthy. In fact, in Rhode Island nearly 500 of these self-described “swamp yankees” turned up in a school lunchroom on January 12, 2017, to meet with Amtrak officials, having learned about the plan only a few days before Christmas. They were absolutely right to be angry, and it’s the sort of ham-handed process which doomed NEC Future, not rich NIMBYs. this is not grounded in fact, nor has Levy’s piece been refuted, debunked, or “turned back” (whatever that means). I’ve been following the East Side Access project for at least 14(!) years now. It’s always seemed like the wrong project to do first. New tunnel/track under the east river, a new station under 34th at Park, and an extension of MetroNorth service to that new station would’ve been far more beneficial to the network as a whole. In other words, with one new station and an investment in the ballpark of ESA all 3 RR carriers would’ve been linked. The fourth regional plan calls on elected officials to modernize and expand the region's outmoded transit networks. How Long Will It Take to Modernize New York’s Commuter Rail System?